St. John Vianney Theological Seminary was officially constituted on March 17, 1999, and inaugurated on the Feast of the Birth of Mary, September 8, of that same year. Since then, the Seminary has been dedicated to forming priests for the new millennium and offering programs of formation for permanent deacons and the lay faithful. 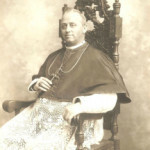 The groundwork of the enterprise was laid by Cardinal J. Francis Stafford, then the Archbishop of Denver, who purchased the site of the former St. Thomas Seminary from the Congregation of the Mission in 1995. 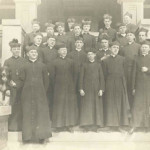 The facility, which included the Archbishop Vehr Library, had served as the focus for priestly formation for the dioceses and religious orders of the region since 1907. The facility was remodeled and re-named the John Paul II Center for the New Evangelization to serve as a campus for the Archdiocesan Chancery. 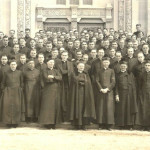 There was also a vision that the campus would become a resource for priestly formation and the renewal of the Church. 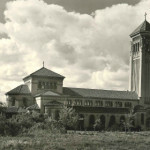 The photos are courtesy of the Archdiocese of Denver Archives. 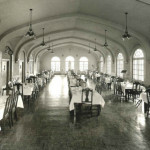 The dates of the photos span many years of rich history. Cardinal Stafford’s successor, Archbishop Charles J. Chaput, O.F.M. Cap., advanced this vision by commissioning a study to determine the feasibility of establishing an educational institution on the site. After much consultation with the priests and people of the archdiocese, Archbishop Chaput announced his plan to open a theological institute to serve the formation needs of clergy and laity engaged in the new evangelization. 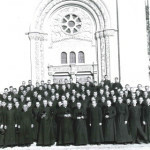 These plans resulted in St. John Vianney Theological Seminary, a free-standing diocesan seminary with a spirituality year, pre-theologate and theologate for priestly formation. Saint John Vianney Theological Seminary is affiliated with the Pontifical University of Saint Thomas Aquinas in Rome for the Baccalaureate in Sacred Theology degree (S.T.B.) and is in the process of affiliating with the same for the Bachelor of Philosophy degree (B.Phil.). Previously the Seminary offered both these degree programs through affiliation with the Pontifical Lateran University in Rome. 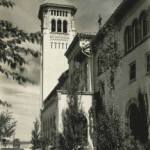 Saint John Vianney is also associated at the undergraduate level with Regis University in Denver. By virtue of this agreement, students who have taken sufficient college credits prior to coming to the Seminary are eligible to use their Pre-Theology course work to complete a B.A. in Philosophy.